The visual gets the selfie treatment from Nicki. Nicki Minaj is the latest artist to join the vertical visual wave, releasing a video for one of her latest singles "Chun-Li." The clip sees NIcki sitting in a pink-filtered room, posing on a lavish couch, finding various angles via the selfie cam. 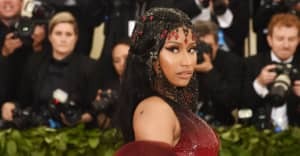 After a brief absence from releasing any solo material, Nicki returned to the fray earlier this week with two new singles, the aforementioned "Chun-Li" and "Barbie Tingz." Check out the "Chun-Li" clip above.